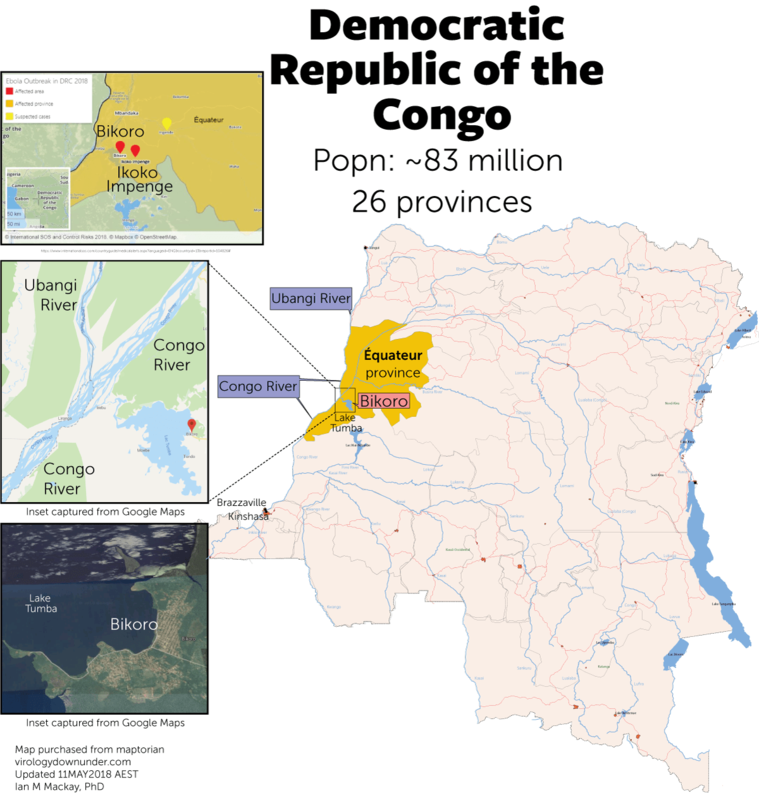 The image to the side is freely available to download from here or from figshare (CC BT 4.0 license and a DOI) alongside with yesterday’s images gets us a little closer to the area of Ebola virus activity in the Democratic Republic of the Congo. I’ve added some Google map enlargements  to show the adjacent rivers that link to Lake Tumba on which the town of Bikoro, shown from a Google satellite image, sits. The only news story that added new information came from STAT news and Helen Branswell who has used her spectacular network of contacts to provide some new insights. concerns that water traffic may be a way for transmission to spread outwards and downstream to some much larger populations areas including Kinshasa (approximately 11 million people ) Brazzaville (approximately 2 million people ) more widely, more rapidly than land routes would otherwise permit. Corrected messed up the location of the village of Ikoko Impenge – my apologies to all!